The Great Gotama gave to the world a complete Teaching of the perfect construction of life. 12. Existence is pain, because it contains old age, death and myriads of pains. 11. I suffer because I am born. 10. I am born because I belong to the world of existence. 9. I exist because I nourish existence within me. 8. I nurture existence because I have desires. 7. I have desires because I have sensations. 6. I have sensations because I come in touch with the outer world. 5. This touch is produced by the action of my six senses. 4. My senses are manifested because being a personality I oppose myself to the impersonal. 3. I am a personality because I have a consciousness imbued with the consciousness of this personality. 2. This consciousness was created as a consequence of my former existences. 1. These existences obscured my consciousness because I had no knowledge. 4. Nāma-rūpa (form—the sensuous and nonsensuous). 5. Shad-āyatana (the six transcendental bases of feelings, sensations). 12. Jarā (old age, death). Thus, the source and the primary cause of all human sufferings lie in obscurity and ignorance. From this issue Gotama's definitions and condemnations precisely of ignorance. He affirmed that ignorance is the greatest crime because it is the cause of all human sufferings, compelling us to value that which is unworthy of being valued; to suffer where there should be no suffering; to take the illusion for the reality; to spend one's life pursuing the insignificant, neglecting what in reality is the most precious: knowledge of the mystery of human existence and destiny. 1. The pain of embodied existence, caused by constantly recurring births and deaths. 2. The cause of these sufferings lies in ignorance, in the thirst for self-gratification through earthly possessions which drag after them the perpetual repetition of imperfect existence. 3. The cessation of sufferings lies in the attainment of a state of enlightened all-inclusiveness, thus creating the possibility of conscious interception of the circle of earthly existence. 4. The path to cessation of these pains consists in gradual strengthening of the elements necessary to be perfected for the annihilation of the causes of earthly existence and for approaching the great truth. 1. Right understanding (that which concerns the law of causes). 7. Right vigilance and self-discipline. A man who has applied these points to life is freed from the pain of earthly existence which is the consequence of ignorance, desire, and longings. When this liberation is achieved, Nirvāna is attained. What is Nirvāna? 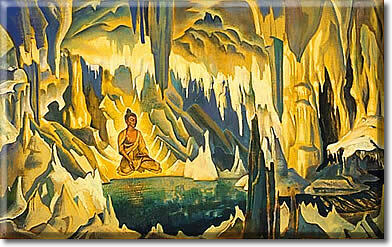 “Nirvāna is the capacity to contain all actions, it is the limit of all-inclusiveness. The tremor of illumination attracts true knowledge. Quiescence is only an outer sign, not expressing the essence of this state.” According to our contemporary understanding we may define Nirvāna as a state of perfection of all the elements and energies in an individual, brought to the limit of intensity attainable in the present cosmic cycle. 1. The illusion of personality. 7. Desire for enjoyment and rest. In Buddhism are expounded to the minutest details the subdivisions of the senses and the motives of the intellectual process as obstacles to or means of development for the facilitation of self-knowledge, through mental training and analyzing each object in detail. Following this method of self-knowledge man ultimately reaches the knowledge of true reality, sees truth as it is. This is the method applied by each wise teacher for the development of the disciple's mind. Preaching the Four Noble Truths and the noble path, Gotama condemned, on one hand, the bodily mortification practised by ascetics, and, on the other, licentiousness – indicating the path of the eight steps as the way of the harmonization of the senses and the attainment of the six perfections of an Arhat: compassion, morality, patience, valor, concentration and wisdom . “Suppose,” said the Buddha to his followers one day, “suppose that a man setting out upon a long journey is confronted by a great body of water, the nearer side of which is beset with many perils and dangers, but the farther side, secure and free of danger; that there is no boat wherewith to cross the flood, nor any bridge leading to the other shore. And suppose this man should say to himself, ‘Truly, this is a great and wide body of water, but of means wherewith to get to the other shore there are none. Suppose I gather reeds and branches and leaves and from them make a raft for myself, and supported on my raft and paddling with hands and feet cross to the safety of the other shore!' Then suppose this man does as he has said and makes a raft, launches it upon the water and, working hands and feet, arrives safely on the other shore. “Then, disciples, this man ought to say to himself, ‘Truly, this raft has been very serviceable to me, for supported by this raft and working hands and feet, I have crossed safely to this farther shore. But suppose I lay it on the bank and proceed with my journey!' Thus, this man would be acting rightly in the matter of his raft. Here we see what little importance is to be attached to anything in this world of relativity –Māyā. Everything, even the Teaching of a Perfectly Enlightened One, is of merely provisory, transitory, relative value. This parable also stresses the necessity of exertion through human hands and feet, the Teaching being effective only if personal efforts are applied to it.